A battery is a vital element of any battery-backed system. In many cases the battery is more expensive than the system it is backing up. Hence we need to adopt all practical measures to conserve battery life. As per manufacturer’s data sheets, a 12V rechargeable lead-acid battery should be operated within 10. IV and 13.8V. When the battery charges higher than 13.8V it is said to be overcharged, and when it discharges below 10.IV it can be deeply discharged. A single event of overcharge or deep discharge can bring down the charge-holding capacity of a battery by 15 to 20 per cent. First, it reduces the requirement of human attention by about 85 per cent. Second, it is a highly accurate and sophisticated method. Input from the battery under test is applied to LM3914 1C. This applied voltage is ranked anywhere between 0 and 10, depending upon its magnitude. The lower reference voltage of 10.IV is ranked ‘0’ and the upper voltage of 13.8V is ranked as ’10.’ (Outputs 9 and 10 are logically ORed in this circuit.) This calibration of reference voltages is explained later. 1C 74LS147 is a decimal-to-BCD priority encoder which converts the output of LM3914 into its BCD complement. The true BCD is obtained by using the hex inverter 74LS04. 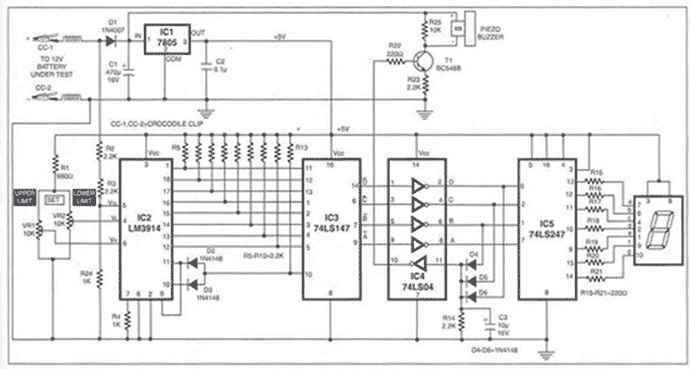 This BCD output is displayed as a decimal digit after con?version using IC5 (74LS247), which is a BCD-to-seven-segment decoder/driver. The seven-segment LED display (LTS-542) is used because it is easy to read compared to a bar graph or, for that matter, an analogue meter. The charge status of the battery can be quickly calculated from the display. For instance, if the display shows 4, it means that the battery is charged to 40 per cent of its maximum value of 13.8V. The use of digital principles enables us to employ a buzzer that sounds whenever there is an overcharge or deep discharge, or there is a need to conserve battery charge. A buzzer is wired in the circuit such that it sounds whenever battery-charge falls to ten per cent. At this point it is recommended that unnecessary load be switched off and the remaining charge be conserved for more important purposes. Another simple combinational logic circuit can also be designed that will sound the buzzer when the display shows 9. Further charging should be stopped at this point in order to pre?vent overcharge. The circuit is powered by the battery under test, via a voltage regulator 1C. The circuit takes about 100 mA for its operation. Set the output of power supply source to 10. IV. Connect the power supply source in place of the battery. Now the display will show some reading. At this point vary preset VR2 until the reading on the display just changes from 1 to 0. The higher reference voltage is calibrated similarly by setting the power supply to 13.8V and varying preset VR1 until reading on the display just changes from 8 to 9.